This is a good foam mattress. I am very pleased with the purchase. 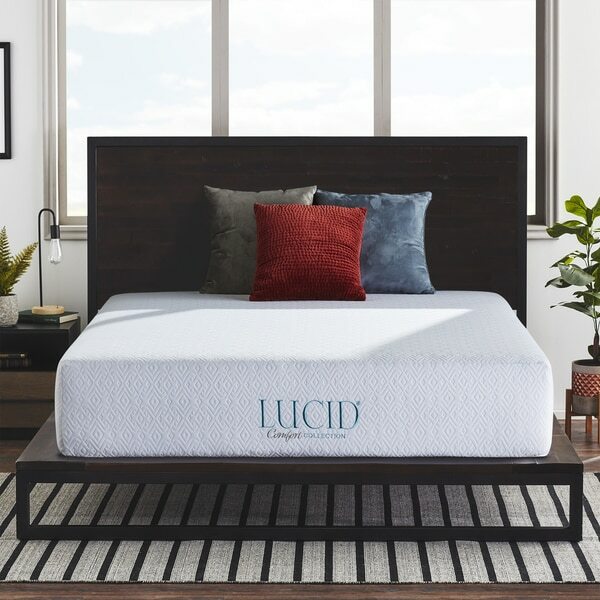 Lose yourself in coziness with this queen-size gel memory foam mattress from the Lucid Comfort Collection. A 9-inch layer of high-density foam provides thick, deep support for your tired muscles, and a top layer of gel-infused memory foam whisks away heat, improves circulation and relieves pressure on joints for a more comfortable night's sleep. I LOVE this bed. We got it for our guest room, but we might honestly find our selves lounging on this one more than our king bed. It was super easy set up and came in a box that I was able to move around myself. The memory foam is nice for me because sometimes beds that sink in start to hurt my back, so this is a perfect balance! Just like they say- a happy medium between plush and firm. Thank you Lucid! Our guests will sleep soundly now. We constantly have guests over at our place and we were tired of having them sleep on our couch so we decided to invest in a bed. Our guest room is small so we needed a twin bed but we also didn't want to spend a lot of money. We decided to try out this bed and our guests have LOVED IT. I slept on this bed the first night we had it and it was amazing, I actually liked it more than my king bed. Where it's memory foam, I felt like I got a little warmer than a different bed, but it wasn't an "uncomfortable warm". I think this bed is great! 5 stars. And the best part, we just shipped it to our door. Where to begin?! Prior to purchasing this mattress, my husband and I had been sleeping on a coil mattress for 3 years. Both of us were experiencing upper back, neck and shoulder pain for the last year. The pain seemed to get just a little worse with every waking morning. Desperate to remedy this, I began my hunt for a new mattress. I spent nearly 3 weeks pouring over mattresses; educating myself on different mattress types, reading reviews, comparing prices. The more I looked, the more overwhelmed I became. We had a decent budget, and even though this mattress was at the lower end of what we were willing to spend, I went for it (theory being that we would have a nice chunk of leftover funds if this mattress didn't work out). We have been sleeping on our Lucid for 2 weeks now. The first morning we woke up, both of us noticed EXTREME upper back, neck and shoulder relief. The pain is all but gone for both of us (the residual probably something a chiropractor needs to tend to). I am AMAZED! Truly amazed!!! The top get layer of the mattress is relatively forgiving and, as Lucid states, is cooling. Neither one of have experienced the typical "heat" most often complained about by memory foam sleepers (mind you it is mid-August here in Pennsylvania. Pretty hot and sticky!). The layer under the gel foam is quite firm. I was a little apprehensive about this, because I wasn't sure what my preference on firmness was. I went out on a limb, and was pleasantly surprised. It IS firm - make no mistake. However, it is a comfortable firm, allowing subtle and appropriate relief to pressure areas. A final note: this is purely aesthetic, but I absolutely adore the cover that comes with this mattress. It is so crisp and sleek. Very nice touch! I would highly recommend taking a chance on this mattress. I was nearly convinced that my morning pain was chronic before our purchase. Thanks Lucid! I loveeee this mattress. I wake up everyday and say thank you bed! It is that comfy. I would recommend this to anyone looking for an inexpensive memory foam mattress. It is a bit tall so just bear that in mine when ordering. Overall 5 stars! Thanks Overstock! The package arrived quickly. After opening it, the mattress fully expanded- even faster than anticipated. There was no odor that sometimes lingers with memory foam products. It presents as a high-quality well-made product. I have a history of back problems and I sleep on my side. Because of that, a firmer mattress is recommended. To be honest, I was concerned at first that it may be too firm. But I realized quickly, that wasn't the case. After sleeping on this mattress for three nights, I returned to my previous mattress (only 2 yrs old) for a week (because I had company and allowed them to use the new bed.) I noticed immediately that I had a lot more aches and felt noticeably less rested. I did a lot of research and read a lot of reviews before deciding on this one. I'm very pleased with my choice and I highly recommend it for anyone with arthritis, injuries, or generalized aches looking for a more restful and comfortable sleep option. It's just what the doctor ordered! Coming from a super huge mattress and box frame measuring 28" inches high, I was skeptical that I could get used to a 12" mattress! But wow it is super comfy especially used in conjunction with the european wood slat frame we also purchased. There was no smell upon opening the plastic vacuum packed bag and within an hour or so we were surprised at how much it expanded! Best to make certain to have your foundation ready because once it expands fully it is quite heavy to pick up! The only thing I am still getting used to is getting up from a flat position as the foam mattress forms to your body at first! But overall I am very happy with our purchase, so much that we bought yet another mattress!! We love the Lucid memory foam mattress with the gel top layer. They are comfortable and very good quality for the price. We looked at mattress that were 3 times the price and really are glad with our purchase. This is our fourth Lucid mattress. This one is for our sons room. AMAZING!! I went from a 10 inch ti the 12 inch and I'm sooooo happy! Don't get me wrong.. I was more than satisfied with my 10 inch because I have a platform beef so I do not want a HUGE mattress anyway. However, I needed a new mattress in a guest room that I use often so I decided to get the newer mattress (12 inch) and put the 10 inch( only a few months old) in the guest room. WELL...I slept onit last night for the first time and boy let me trell you... I slept like a baby. I suffer from insomnia and I'm restless all night but last night was different. I know I will continue to rest more peacefully on my new mattress... you can't go wrong with this mattress. Could not believe how fast it expanded after removing from box. In less then an hour it reached almost its full size. Let it set and breath with ceiling fan on and did not notice any strong odor. Received it around noon and slept on it after 10 hours of opening. Thought it felt firm on first sleeping on, probably because was use to pillow top mattress. After sleeping on for a few nights find that I am very comfortable and have no problem sleeping and no back pains when I wake up. I want to begin with the fact that I bought this exact mattress in 2011 from amazon, and I loved it! I had to toss it due to mold growth on the mattress. So I wanted to buy it again, since it was SO comfortable. But lucid changed something, I just woke up from the worst nights sleep! It feels like I’ve been sleeping on a rock all night, this mattress is uncomfortably firm. I’m writing this from bed now, got in a bad 8 hours last night. And since my back is inflamed and throbbing in pain, I will be returning it. My daughter and her friends love this mattress! It’s super comfortable & expanded perfectly within 48 hours. Excellent bed and very comfortable! Before I got this mattress, I would wake up in pain every morning. This mattress is so comfortable and my pain is gone. I am sleeping better and waking more rested. Very nice thick and plush! Came wrapped up very secure and let stand for over 48 hours and you got a good quality mattress! Was a gift for my sister and she loved it!thanks overstock! This was a great find!!! My daughter has scoliosis and always complains about her mattress. I must admit we were skeptical at first when this long skinny biz arrived with a MATTRESS IN IT! We unwrapped it and placed it in te bed and watched it start to plump up. Within a few hours it was all filled out. My daughter is thrilled with it. It is comfortable and she has no more complaints about her back. A little firm for a side sleeper. Delivered right to my door in 2 days, free shipping. Comfy bed. We got my daughter the 10 inch, and my son the 12 inch. They both love it. My son is heavy set, so we decided to get the 12 inch for him. the bed Is co comfortable and I can sleep throughout the night without feeling tired or sore the next day. This mattress is wonderful! It's so comfy and affordable. I would recommend to anyone needing something sturdy but soft. Very good value for the price. I really liked that it was shipped in a box. "I need this mattress to be 74 inches long. It is for an RV and there is only so much room. The last foam mattress we cut to length with an electric knife and it worked very well. Will I be able to trim your mattress the same way?" "Our queen size mattress had a gully in the center, that 24 hours later is still there. The rest of the bed has fully expanded, but not this crevice in the middle. Should I flip it upside down? Thanks, Maureen"
"What is the break down of the layers that make 11” it only states 9” high density?" This mattress has a bottom layer that is 9-inches of supoport foam. The top layer is 3-inches of ventilated memory foam that has a density of 3lbs./ft3. This makes for an ideal medium-feel mattress. "Can this be used with the lucid adjustable frame?" Yes! This mattress pairs great with the L100 or L300 adjustable bed base. "What are the specific layers that make up this 12" mattress?" "Can I use this mattress with an adjustable bed?" Hello! Yes, you can use this mattress on an adjustable bed. You can also use it on box springs, platforms, metal grids, and slatted bases. If you have any additional questions, please let us know. Thank you! "Tell me more about the warranty? Can I return the mattress if it doesn’t work for my body? I have back pain and it is very important that I get a mattress that doesn’t have any pressure points. If I were to return the mattress would I have to pay shipping? Sincerely, Overstock Customer for seven years plus"
We cannot warranty for comfort only for manufacturer defects. There is a 30 day warranty for comfort and the return is handled by us.